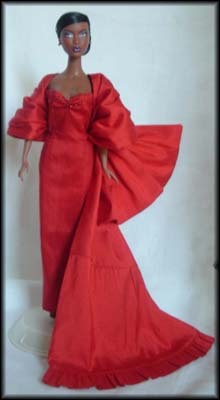 Up for consideration is Rememberence for 12" fashion dolls. The pattern includes a floor length fitted dress with a lined layered wrap. The pattern was designed by Gary Fletcher. A similar design is also available for 16" Tyler Wentworth dolls called Drenched. The PDF version of this pattern prints on A4 and 8 1/2 x 14 legal size paper.